Located within the National Nature Reserve of Laguna de Apoyo. This stunning lakefront home is located just 200 meters from Norome Resort/Villas @ Apoyo (on paved roadway) and is built to U.S. standards. Relax in the infinity pool while enjoying the view of the dormant volcano Mambacho or take a swim in the lake where you will find hot thermals nearby. If you would prefer more activity, rentals of Hobie Cats and Kayaks are available from the nearby resort. As an added option, we can arrange on-site massage in the tranquil outdoor private patio setting, with lake-shore waves as a background. On-site private Spanish tutoring can be arranged by a local professional instructor and family friend. This is truly a private vacation oasis with over an acre of professionally landscaped grounds of natural flora, lawn and gardens! Casa de Sol allows you the ultimate in privacy and relaxation...Easy access by bricked roads, Gated entry with 24 hour security. Upstairs is a master suite with king size bed, custom tub for two with raindrop shower. The other 4 bedrooms are “Jack & Jill” configurations (2 bedrooms w/bath in middle). All bedrooms enjoy private balconies, a/c and hot water. The home includes bath towels, soaps, hot water and high quality linens. Downstairs there is a modern kitchen with gas stove and oven, island of hardwood, refrigerator/freezer, water cooler and all utensils. Also for cooking is a large gas grill outside. The large custom dinner table w/chairs easily sits 10-12 people. There is a ½ bath in the living room area and ½ bath poolside. Daily maid service is included with optional laundry service, personal cook and private Spanish lessons available at your request. Our bi-lingual property manager is on-site to assist you with any other details to ensure a fabulous experience. In preparation for your visit, we can assist with a map and driving instructions, rental car, car/van and driver, tour guide, day shopping trips, outdoor excursions and any other guidance you require. High speed wireless network (we have our own tower), cable TV and local telephone calls are included. Different rates apply during holidays. View the Casa de Sol website: referenced below in this listing 'Links to more information:CLICK HERE - Additional Info'. We live in the Pacific Northwest and love it...except the long wet and cold winters get very long, wet and cold. We were thinking about eventually finding a place to escape the winter weather when Casa de Sol found us! Even though this idea was 10 years off, we knew we would never find a place like Casa de Sol. Since we are both still working and have a young family we decided to offer it as a vacation rental for now and eventually make it our 3-6 month home. The natural beauty and tranquility make this a magical place! Solitude, incredible views, natural beauty, accommodates a large group of friends and family. High quality - US standards. We have our own tower for better reliability and reception. Smoking only allowed outside the house. The place is just about the nicest place I've ever rented in Nicaragua and I've rented a lot. Pool area fantastic. Cabana great. Swim in lake or pool. House well decorated. We had a great time. Protesters made rthe trip to airport an adventure as they closed most of the main roads hopefully this portest will end soon. Really nice place. The infinity pool overlooking the Laguna is pretty neat and refreshing. Went for morning runs along the Laguna perimeter road which were hilly and challenging. Overall great stay. 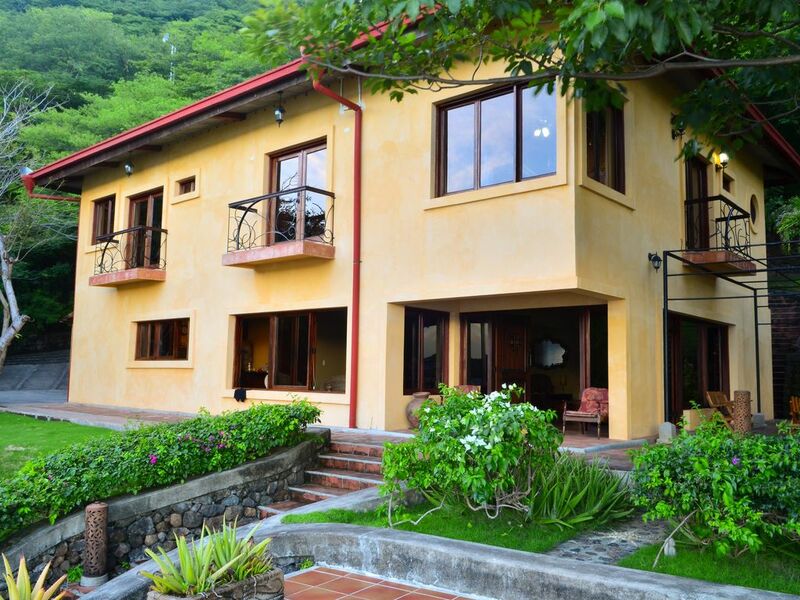 This is hands down one of the best rental homes in Nicaragua. It offers amazing views of the lagoon in a very private and serene setting. You also have 2 waterfront restaurants within walking distance. Day trips to Granada and Masaya are only 1/2 hour away. The house itself offers very high end finishes, very comfortable beds and cold ac in the bedrooms. The natural infinity pool is a dream overlooking the lagoon. The staff is very helpful and accommodating. The only logistics you have to consider is to do a complete grocery shopping trip before arrival, as supplies are very limited in the immediate vicinity. All in all, this property, amenities and location are 5 stars! Thank you to the owner and staff for the amazing hospitality...we will be back! It is a pleasure to have you visit Casa de Sol. Thank you for the nice review and you are welcome back anytime. Best of wishes to you and your family for 2018. Great multi-generation family holiday vacation! From the moment we stepped out of the vehicle, we were all in love with the house, the pool, the lake and the view! We enjoyed our 4 days on Lake Apoyo and would definitely return!! Thanks for sharing your home with us. **Do take heed to the advice of 4 wheel drive to get up the drive way!! The house is located right on the lake. Rooms are large and ther are three with views to the lake. All was clean and the house was well stocked with everything you will need. We had a very restful visit that was made even better by the great staff that attends to the house. We only wish that we could have stayed longer. Next time. Thank you so much for your review. What makes me the most happiest is you had a restful visit and you appreciated our staff which is so great to hear. Please let us know when you are visiting again! Follow signs to Villas at Apoyo, 100 yards before the resort. Prices quoted are based on 5 overnight guests. Prices will vary during national and school holidays.